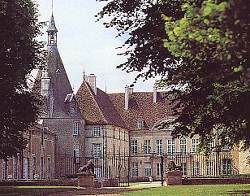 The Château de Commarin is not far from Châteauneuf. Commarin is anything but a museum, although it is filled with furniture, paintings and tapestries. It is the home of a family and families have memories. The pictures that hang upon the walls hang here because they belong here. They would not look the same on the walls of some museum. Commarin particularly illustrates this point because it is a domain with the rare distinction of having always been occupied and never been sold. It has often passed through the female line and by their marriages has become associated with many of the noble names of Burgundy. Comte Charles de Vogüé is the present owner. Commarin emerges from the mists of history in 1346, its name coupled with those of Jean and Jacques de Cortiamble. Jacques was chamberlain to Duke Philippe le Hardi. Between them, father and son created Commarin as a place forte and thus established the size and disposition of all the future buildings. 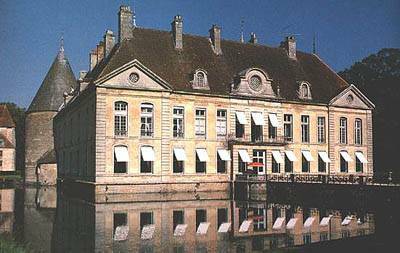 The southern and western ranges of the court, all that remained of the medieval house, were pulled down and replaced by the architect Philippe Paris with the simple but dignified façades which we see today. The eastern range of the courtyard, together with the stable block, had been part of the reconstuction of the whole forecourt (17th century). Two tall pavilions "les pavillons Louis XIII" which mark the north-east and north-west angles, were built and united by a new wall to the fine ornamental arch, which has now been moved to form an outer entrance.